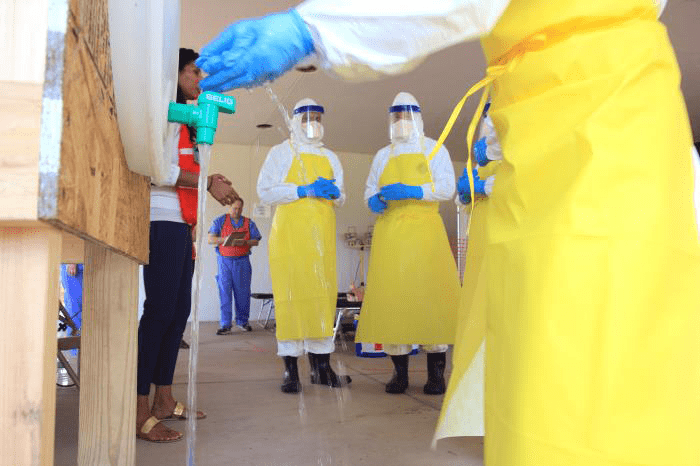 The National Institute of Environmental Health Sciences (NIEHS), part of the National Institutes of Health, is launching a new program to help train approximately 35,000 first responders and workers to protect themselves from infectious diseases. The three-year, $9 million program is being launched in collaboration with the Centers for Disease Control and Prevention (CDC) and other federal agencies. The NIEHS Worker Training Program (WTP) will oversee the Ebola Biosafety and Infectious Disease Response Training, which will educate health care workers, as well as personnel in waste management, transportation, mortuaries, and other occupations with the potential for infectious disease exposure. The environmental infection control practices and hazard recognition skills taught will be applicable to any high risk infectious disease that can be easily transmitted person to person and may result in high mortality rates. Duke University, Durham, North Carolina, led by Richard Frothingham, M.D. Emory University, Atlanta, led by Alexander Isakov, M.D. Indiana University Bloomington, led by Shawn Gibbs, Ph.D.
Rutgers School of Public Health, Piscataway, New Jersey, led by Mitchel Rosen, Ph.D.
University of Alabama at Birmingham, led by Lisa McCormick, Dr.P.H. Read more: How Much Will the First Responder Anthrax Preparedness Act Cost? For more than 25 years, WTP has offered health and safety training to workers exposed to hazardous materials, including dangerous biohazards. WTP also provides important worker safety guidance during national and regional disasters. Training over 160,000 workers annually, WTP-funded organizations use small-group, hands-on instruction and train-the-trainer models to build local programs that can provide training to hazardous material workers, first responders, and disaster recovery volunteers, as needed. The new infectious disease program will use this same model.